It Came from the Library! 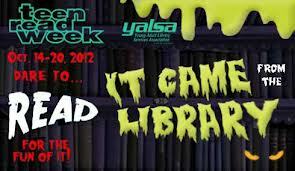 This Teen Read Week™ (Oct. 14-20), YALSA dares you to read for the fun of it! Teen Read Week is a time to celebrate reading for fun and encourage teens to take advantage of reading in all its forms —books and magazines, e-books, audiobooks and more — and become regular library users. 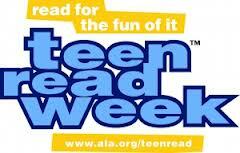 During this time libraries have fun and exciting games for teens to get involved in reading. So I DARE YOU TO GET A TEEN TO READ FOR FUN..